New Sons of Spanish American War Veterans Camp forming in Southern Illinois. For more info., click here! 23rd U.S. Infantry, Casual Detachment (October 13, 1881 - September 6, 1956) (Rock Island National Cemetery, Arsenal Island, Rock Island Co., IL)++. 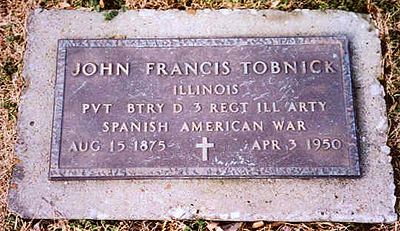 1st Texas Volunteer Infantry, Co H., (Died January, 1915)( Section 4, Block T, Lot 21, St. Adalbert Catholic Cemetery, Niles, Cook Co., IL). Thanks to the following people for contributing information to the page!